Can I please buy one of your kidneys? Should we legalise the sale of human organs? In the UK alone the average waiting time for a kidney transplant is 3 years, this costs the NHS around £24,000 per patient per year and in 2013 – 2014 1000 people died whilst on the transplant waiting list. Dialysis patients also often say they feel that they are just existing rather than living. But, if these patients could get a transplant from a living donor, their life expectancy would increase up to 23 years and their lives could really begin. With increasing cuts to the NHS budget is it possible that the cost-effectiveness of kidney transplant might persuade the government to legalise a market in human organs? The implementation of a legal organ market would also increase the human organ supply and eliminate the consequences of the black market. Due to a shortage in organs, the black market and transplant tourism is thriving. Annually, 15,000 – 20,000 illegal kidney transplants take place around the world, often in developing countries such as India and the Philippines. There are even slums in the Philippines dubbed “kidney-vile”, as the majority of the slum’s residents have been driven to sell a kidney. But the black market is built on systematic deception. Brokers coerce desperate workers to sell a kidney then give them much less money than they were promised. Nor do they care about the surgical quality and often leave donors with little or no aftercare. Consequently, donors often become ill and are unable to continue their usual hard labour, which perpetuates their poverty, rather than alleviating it. Recipients are also affected by black market fraud: often these kidneys are not screened properly and donors are coerced to cheat their medical records. As a result of these schemes and poor hygiene standards, recipients often contract diseases such as hepatitis B/C and HIV. 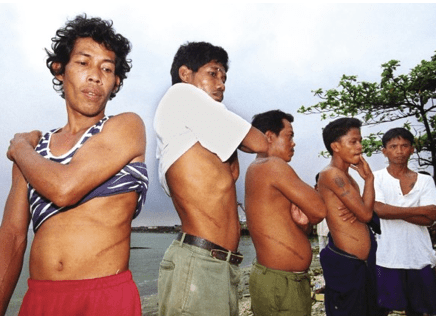 Group of men from Baseco “Kidney-ville” in Philippines, displaying their scars from selling a kidney. Iran is currently the only country with a compensated and regulated kidney donation program. In this system, there are no brokers and it is charity organizations that coordinates donors with recipients. The government pay a fixed price for organs and cover the costs of all necessary aftercare for donors. Due to this system, Iran is currently the only country with no kidney transplant waiting list. It has also successfully eliminated its black market, and has still maintained a respectable percentage of altruistic donations. Nevertheless there are flaws to the Iranian system as discussed here. Erin & Harris proposed an ethical, highly regulated, system in which only individuals within a nation are eligible to sell or receive organs. The market would have one purchaser (e.g. the NHS in the UK) and organs would be allocated fairly, giving recipients an equal chance of receiving a transplant regardless of their economic background. This system would also remove the draw for brokers, and subsequently reduce the exploitation of vulnerable people. Medical screening would ensure only healthy individuals could sell an organ, which would to minimise risk (Gill & Sade, 2002). Such a system would also provide proper medical care for donors who would also benefit from a full psychological evaluation, to make sure they are aware of the consequences of their actions. A study of 478 donors from the Iranian regulated system has shown their health did not deteriorate after the sale, and that 90% of them were content with selling their kidney. These results contrast markedly with the study of 305 Indian donors in an unregulated market. The health of 90% of these donors declined, people living below the poverty line rose up to 20% and 79% of donors would not recommend selling a kidney. This shows that within a regulated program, both vendors and patients are better cared for and are more satisfied with the transplant process. The strongest argument against the sale of organ is the possible exploitation of the poor. Critics argue that legalisation could lead to a market that would exploit poorer people, as they might view organ sale as a last resort. But, is it exploitation if a person makes a reasoned decision to take an action they consider to be the best option to improve their life? One can’t assume that money would simply overrule a person’s judgment. A black market would also lead to greater exploitation than any legalised market ever would. Prohibiting an organ market is paradoxical, to restrict an individual’s autonomy and cause moral harms to liberty. Another prominent argument against the sale of human organs is that it would lead to commodification of the human and therefore corrupt human dignity. Commodification is an unsuitable term to use for the sale of a kidney, since there are numerous other circumstances when paying money does not insinuate loss of dignity, such as surrogacy.The scarcity of organs and, death and exploitation of people will not be resolved through rhetoric of moral repugnancy and human dignity. Under prohibition, patients are suffering and dying whilst waiting for a transplant. Both vendors and recipients are exploited by the black market, and the human rights of poor people are violated. These problems will continue to exist as long as there is a dearth of organs. So, should a market in human organs from living persons be legalised? Or is it merely a naive and impractical idea, only appropriate for a dystopian future. Either way, the possibility of legalising a regulated and ethical market should be explored. Erin, C. A., & Harris, J. (2003). An ethical market in human organs. Journal of Medical Ethics , 29 (3), 137–138. Ghods, A. J. (2009). Ethical issues and living unrelated donor kidney transplantation. Iranian Journal of Kidney Diseases , 3 (4), 183–191. Goyal, M. (2002). Economic and Health Consequences of Selling a Kidney in India. Journal of the American Medical Association , 288 (13), 1589. Higgins, R., West, N., Fletcher, S., Stein, A., Lam, F., & Kashi, H. (2003). Kidney transplantation in patients travelling from the UK to India or Pakistan. Nephrology Dialysis Transplantation , 18 (4), 851–852. Hippen, B. E. (2005). In defense of a regulated market in kidneys from living vendors. The Journal of Medicine and Philosophy , 30 (6), 593–626. MacKellar, C. (2014). Human Organ Markets and Inherent Human Dignity. The New Bioethics: A Multidisciplinary Journal of Biotechnology and the Body , 20 (1), 53–71. Moazam, F. (2009). Conversations with Kidney Vendors in Pakistan. Hastings Center Report, (June), 29–44. Organ Donation. (2015). Transplant save lives. [Online] Available from:http://www.organdonation.nhs.uk/newsroom/fact_sheets/transplants_save_lives.asp. The Wall Street Journal. (2015). Cash for kidneys: The case for a Market for organs. [Online] Available from:http://www.wsj.com/articles/SB10001424052702304149404579322560004817176. This entry was posted in SciCom activities on September 1, 2016 by S.Fox.